Whether it’s in the garden, down the park or on your telly, celebrate the beautiful game with beer, nachos and fully loaded hot dogs. 1. Heat the oil in a large, lidded pan and add the onions with a pinch of salt. Cook slowly with the lid ajar for 10 minutes, until softened, then fry, uncovered, for another 15-20 minutes, until very soft and starting to caramelise. Add the garlic and cook for a few minutes more. 2. Increase the heat to high, then add the honey and beer, scraping the base of the pan. Nestle in the sausages, ensuring they are mostly covered. Simmer briskly for 4-5 minutes, until heated through; transfer the sausages to a plate and cover with foil. Reduce the onion mixture, stirring, until thick, about 8-10 minutes. Stir in the mustard, season and take off the heat. 3. Griddle the sausages or put on a hot barbecue until charred. 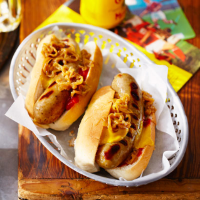 Split open the buns, add the sausages and top each with a spoonful of onion-mustard jam. Add ketchup and more mustard before serving, if liked.